The Ruger 10/22 is one of the most successful rimfire rifles of all time…experiencing incredible popularity since its release in 1966. These days, there are tons of different versions of the 10/22. There’s 14 models (not including distributor exclusives, which increase that number) across eight different variations…not to mention clones from many custom manufacturers. 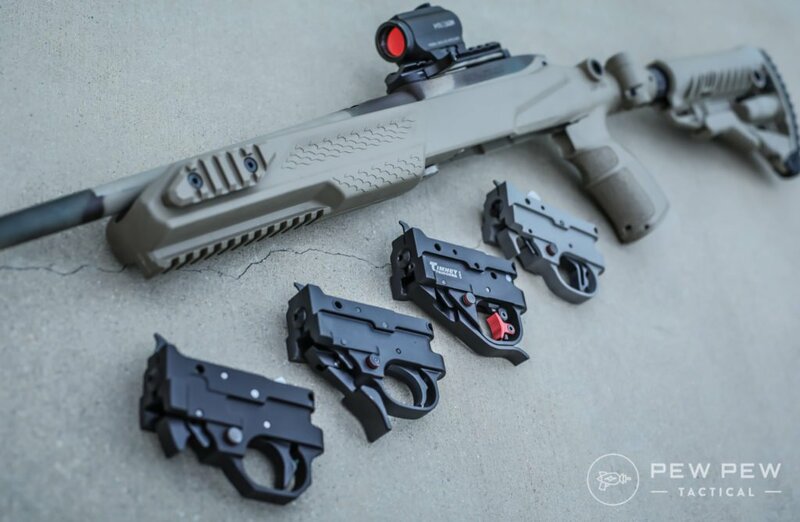 With so many options, it can be surprisingly difficult to choose which particular version of the Ruger 10/22 suits your end purpose. Fortunately, I’m here to help you figure out which Ruger 10/22 model is the best for you. And then finish it off with some upgrades to truly make your 10/22 perfect. The Ruger 10/22 Carbine is the OG of 10/22 variations and it’s now considered the standard 10/22 variation, so it’s only appropriate that it’s where we start. Now, realistically, any of the 10/22 Carbines are great for general purpose and just shooting for fun. They all have the same simple design, with an 18.5” barrel and 37” overall length, as well as an adjustable rear sight and a gold bead front sight. The only reason I pick the Model 1151 over the others is that I personally prefer the classic hardwood stock for a classic rifle like this one. If you like the black synthetic stock, any of the other 10/22 Carbine models will do just fine. 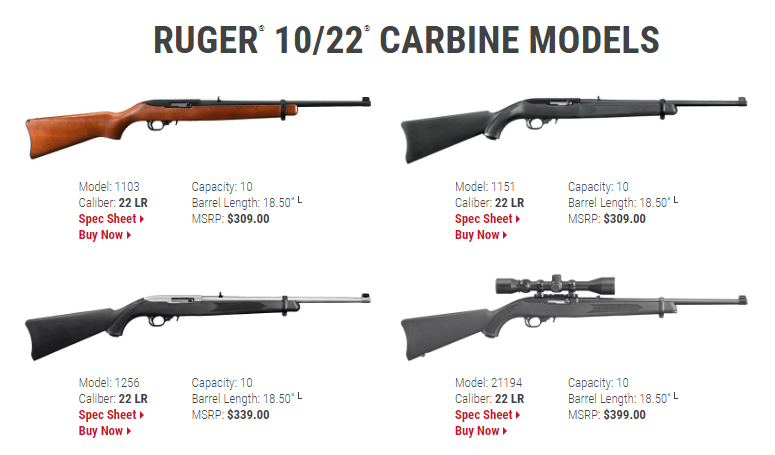 And just in case you got a recommendation from a friend and are feeling a little confused, Ruger used to call the Carbine models with the synthetic stock their All-Weather models, and then their Synthetic models, but now they’re just categorized as 10/22 Carbines. Another 10/22 Carbine, the Model 21194 is my top Ruger 10/22 choice for hunting. It has the same advantages as the other 10/22 Carbines: it’s got a light and compact build and is super easy to shoot. The black synthetic stock also gives this model some extra protection against the weather and any bumps it takes while your traipse through the wilderness in search of your prey. But what really makes the Model 21194 stand out from the other 10/22 Carbine models is the included Weaver™ 3-9×40 scope with a Dual-X reticle. This waterproof, fog proof, and shockproof scope is perfect for hunting varmints and small game. 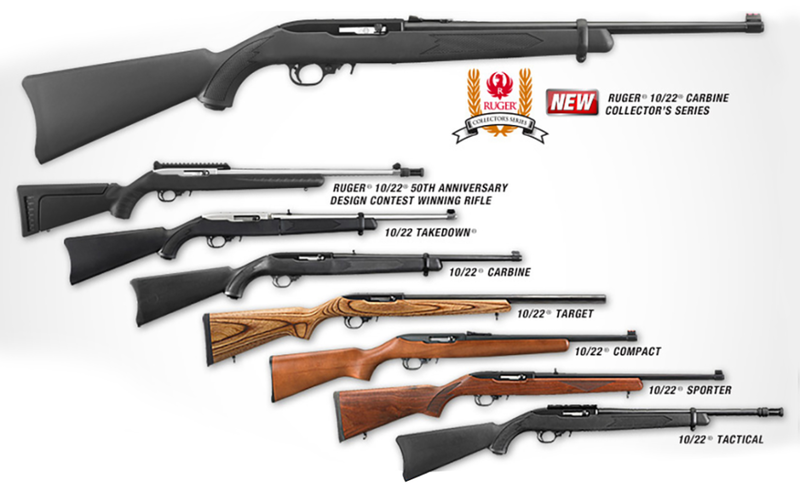 The Ruger 10/22 Competition is the newest addition to the 10/22 lineup, introduced in October 2018. As of the time of writing, there was only one model of this variation, the Model 31120. 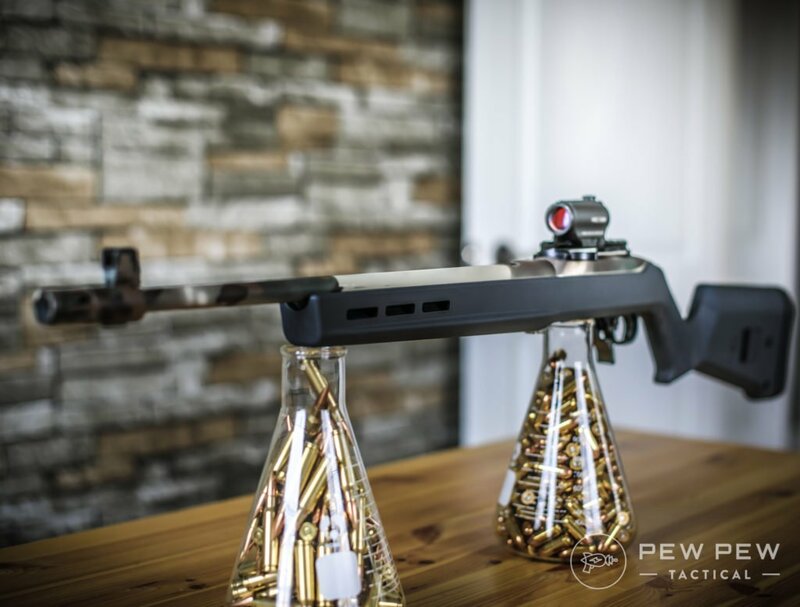 The 10/22 Competition was designed, as the name suggests, to provide Rimfire Challenge competitors with a top of the line 10/22 ideal for the range, and every part of the rifle has been optimized to accomplish that goal. The 6061-Tg511 aluminum receiver is CNC-machined, hard-coat anodized, heat-treated and stress-relieved, and has an integrated 30 MOA Picatinny rail, ready for your preferred optic. A second bedding lug keeps the stock firmly attached to the laminated stock, which is painted and textured to provide a more secure grip. A vertically and horizontally adjustable cheek rest allows the shooter to position the rest in the way that feels best for them. The 16.125”, heat-treated, 4140 steel free-floating bull barrel is fluted for reduced weight and improved heat dissipation and has a threaded muzzle for whatever barrel accessories you like. If you’ve read some of my other posts on rifles, you may recall that I’m a sucker for takedown rifles. The takedown concept will just never lose its novelty for me. In addition to being a personal favorite, takedown rifles are also ideal survival rifles, and the Ruger 10/22 Takedown is no exception. Once again, all the 10/22 Takedown models are great, but I recommend the Model 11112. Like the other two, it has a lightweight synthetic stock and is quick and easy to disassemble and reassemble, so you can use it when you need it and stow it when you don’t. But it also has a gold bead front sight and adjustable rear sight, a threaded barrel, and flash suppressor feature that both other models don’t have. On top of all this, it also has the shortest overall length, despite a respectable 16.4” long barrel, making it the easiest to stow. What’s your take on the takedown model? This is another model that’s the only one of its variant. The Ruger 10/22 Compact is an even more scaled down version of the already diminutive 10/22 Carbine. It has a shorter barrel (16.12” instead of 18.5”), shorter overall length (34” instead of 37”), and a shorter length of pull (12.5” instead of 13.5”), all of which makes this gun great for smaller builds. It also has fiber optic sites, with an adjustable rear sight, making it easier for youngsters to line up their shots. Many of us grew up shooting the 10/22 and know that it’s already a fantastic rifle for kids, but the 10/22 Compact makes it even better. 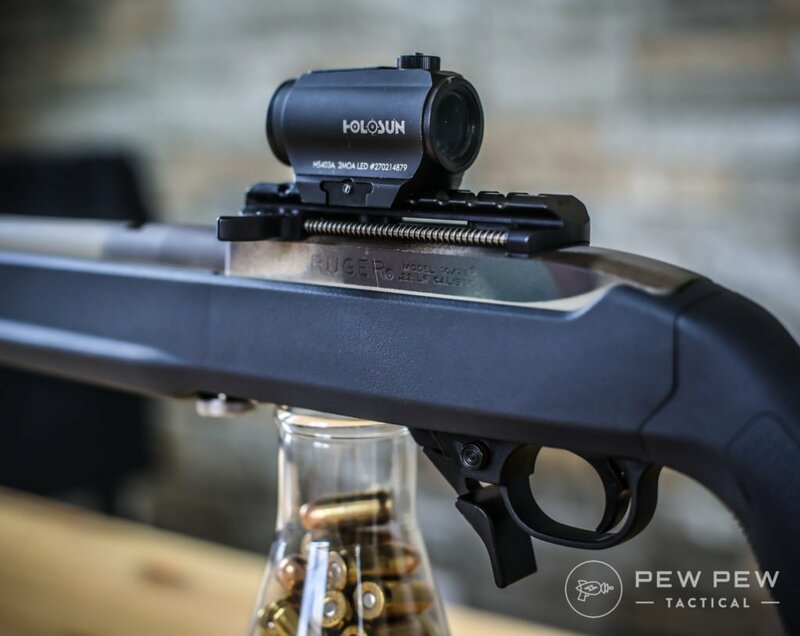 A large part of the fun of the Ruger 10/22 is the availability of fantastic aftermarket upgrades, in the form of both parts and accessories. Similar to Glock’s pistols, it’s possible to build a 10/22 completely out of aftermarket parts. But if you don’t want to do the entire build yourself and don’t want to pay a premium for a custom build, and just want to improve on an existing 10/22, you should go with the Ruger 10/22 Tactical, available only in Model 1261. 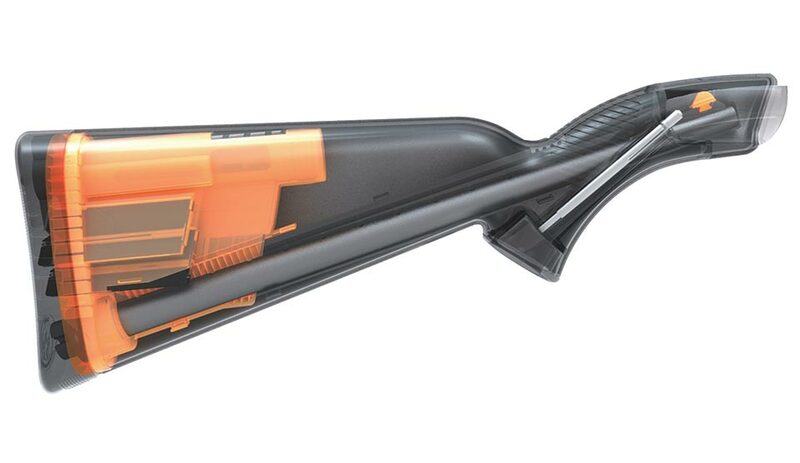 The 10/22 Tactical was designed to be upgraded. It has no sights and instead has a 3/8″ aluminum Picatinny rail to allow you to just use your preferred optical accessory. The threaded barrel comes capped with a Ruger flash suppressor, but you can obviously switch that out for a different barrel accessory if you prefer. 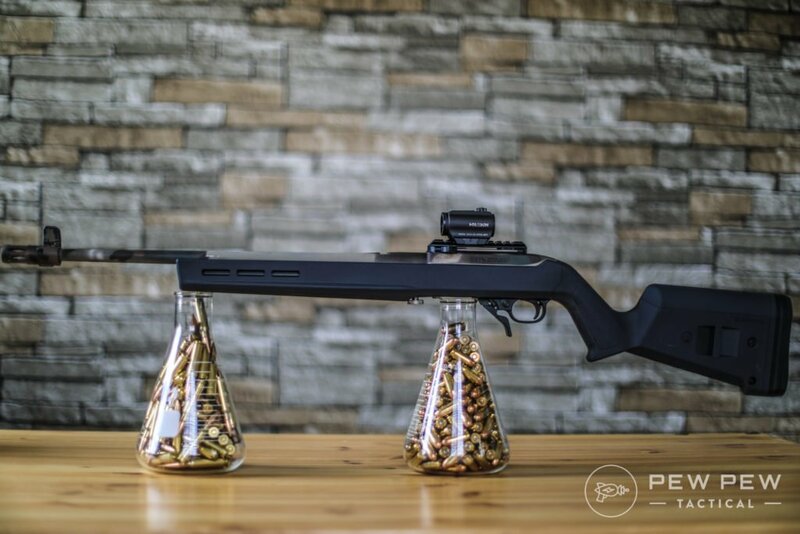 And at just 4.3 lbs, the 10/22 Tactical is the lightest of Ruger’s 10/22s, so you can add plenty of accessories without having to worry about the rifle’s weight. Okay, so obviously the T/CR22 isn’t technically a model of the Ruger 10/22, but it’s a damn good 10/22 clone. 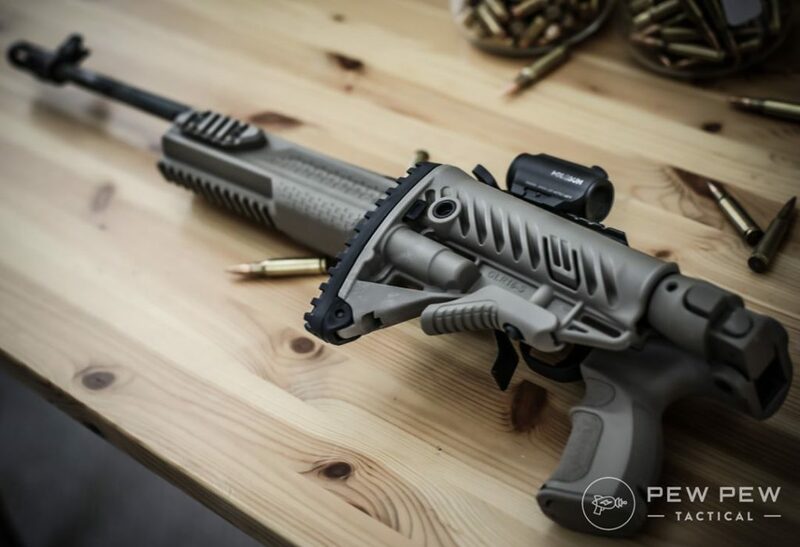 In addition to the qualities of the standard Ruger 10/22 Carbine, the T/CR22 has a few upgrades, like a knurled cylinder charging handle and a Picatinny rail machined into the receiver itself. The T/CR22 also has a rear peep sight with a larger rear sight aperture and a fiber optic front sight. The stock was designed in collaboration with Magpul and is a simplified version of their X-22 stock. The bottom of the stock has two M-LOK slots for adding accessories, but you could cover them with Picatinny rails if that’s more your style. If you want an upgraded 10/22 with a modern look, this is definitely a rifle to look at. Designed by ArmaLite (same people that would later bring the world the AR-10 and AR-15) Henry Repeating Arms now produces the AR-7 and it has become a popular choice for bugout bags, backpackers, and plinkers. The main feature of this little rifle is that it can be broken down and stored inside its own buttstock, giving you an easy, waterproof, method of carrying and storing the rifle until you need it. Handy, lightweight, and ready when you need it – if the Ruger 10/22 Takedown isn’t survival enough for you, the AR-7 might be. Maybe a complete rifle isn’t what you’re looking for or maybe you’re looking for a custom rifle that isn’t a standard model – building your own 10/22 clone is a lot easier than you might think! Brownells has recently come out with their own line of 10/22 clone receivers that include stripped receivers, barreled receivers, and even takedown receivers. All of them fully compatible with standard and aftermarket Ruger 10/22 parts and accessories. Besides the AR-15 and Glock…you’ll be hard pressed to find another firearm with as much aftermarket support as the 10/22. There’s a bazillion stocks,sights, and accessories to fit your mood. Plus what I think is the best mod is a trigger upgrade…there’s plenty of those too. Find out everything we love in Best 10/22 Upgrades and specifically…Best 10/22 Triggers. That’s a wrap on my recommended Ruger 10/22 models for a variety of different purposes. Now don’t take any of this to say that any of the other Ruger 10/22 models or variations that I didn’t get a chance to talk about here aren’t great guns. After all, the Legendary Ruger 10/22 is called “legendary” for a reason and the fact that it’s continually one of the best selling rifles of its kind indicates that the reason isn’t just an excellent marketing team. And, of course, you may have extenuating circumstances or just slightly different preferences from me, so if the 10/22 isn’t quite what you want, you should look at the other models in the same variation and at other, similar variations. With so many Ruger 10/22 models available, not to mention a huge market for upgrades, you’re sure to be able to get a 10/22 that’s perfect for you. Ready to upgrade your 10/22? We have you covered with our Best 10/22 Upgrades article! Or if you need recs on what .22LR ammo to feed it…check out Best .22LR Ammo. Still have questions about the 10/22? Have your own 10/22 recommendations? Want to tell us about your sweet 10/22 build? Share it all in the comments below. Basic 10/22s have one feature that is a SHAME ON RUGER! The triggers are terrible terrible terrible. Then they offer a decent trigger assy. for sale to you after you just bought a new rifle. This is wrong. Their customers deserve better. I sent mine to Brimstone Gunsmithing because I was mad at Ruger. Now I have a beautiful rifle with a 2 1/2 lb. sweet trigger. I am a loyal Ruger owner, with the 10/22, a MK2 Target .22 pistol and a sr1911 in 45acp. I have a TALO M1 Carbine replica 10/22. It is a great rifle. I have received many compliments on it, it is accurate and easy to shoot. I did have to replace the sights, but other than that I’s been great. This was, IMHO, an incomplete article. It really didn’t talk about anything that everyone already knows. I have been collecting 10/22s for 40 years and must point out that the newer guns are no where near the quality of the original 10/22. The 10/22 is beyond a doubt one of my favorite firearms EVER. I love shooting it and have a few for various purposes. The customization possibilities are virtually endless. Its reliable as all get out too! Love it no matter what its form!